The Queen is Sovereign of the Most Honourable Order of the Bath, an order of chivalry whose members are typically senior military or civil servants and whose title comes from the ritual washing involved in the medieval conferment of knighthood. But because it ranks lower than others such as the Order of the Garter, we do not typically see the Queen use the insignia of the Order of the Bath. One exception is the Order's service, held at Westminster Abbey. The service is held every four years; the Sovereign attends every other service. 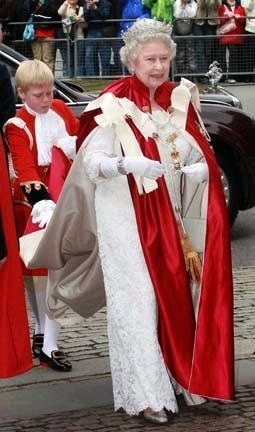 The service is one of the rare occasions at which we see the Queen wear a tiara during the daytime. She may pair different earrings and bracelets with it (here, the Diamond Cluster Earrings and Queen Mary's Chain-Link Bracelet), but she consistently selects the Girls of Great Britain and Ireland Tiara for the job. Her favorite tiara must be a great fit for these types of services, as she's used it for other instances as well. Click here for 2014's service.